Virtual reality used to be something that only existed in science fiction stories. Today, virtual reality is becoming our primary reality. We do everything online. We watch movies online, socialize online, date online, shop online, work online, read online, go to school online, the list seems endless. With how much of our lives we live on the internet, it’s amazing how much we take it for granted. We love the convenience of getting on the internet from anywhere; in the mall, coffee shops, airports, hotels, and from any room in our house, and anywhere else we can nab a free Wi-Fi hotspot. But do we realize what we are giving up for that convenience? The answer to that is: maybe not. I was curious and so just yesterday I asked some of my friends, all of them very tech-savvy college students, if they knew what an Ethernet cable is. Out of the 6 people I asked, only one person knew what it was. So if you’re not sure what an Ethernet cable is, don’t feel bad, a lot of people don’t. An Ethernet cable is used to transfer information. That means that you can use an Ethernet cable as a wired connection to the internet. Wait, you mean people connect to the internet…with wires? Why do that when you can do it wirelessly from virtually anywhere? That is a good question, my friend, and it has a good answer. It’s true that wired technology is old. Ethernet was born back in the days of Walkmans, VHS, MC Hammer pants, and stone washed jeans. Thankfully our technology and fashion have improved (well our technology has anyway). Ethernet has now had about 30 years to get better, and it’s become a pretty awesome way to get online. So let’s take a look at why Ethernet is still going strong even with wireless getting all the hype. I’m sure everyone has had issues trying to connect to a wireless network. And when (not if, when) you have an issue, it’s nigh impossible to troubleshoot. And that’s just connecting to a wireless network, trying to set one up can cause all sorts of headaches. Not to mention the constantly changing standards for network encryption. Wireless networks are prone to a variety of connection issues, particularly if you try to access the network at the edge of its wireless range. It’s also not uncommon for the router to crash and need to be reset. I can’t even think of how many times I’ve had to do this at my house. Wired networks hardly ever go down unless the power goes out in the entire building. Wireless networks also have issues when things like walls get in the way of the signal. My old apartment complex had the wireless access in a different building. That meant that the only way I could get online was by standing in the far corner of the kitchen next to the window. And even then if I moved the wrong way I lost connection. We really are part of an impatient culture; we don’t want to give up precious seconds of our lives waiting for a page to load or some program to download. And why should we? I remember waiting hours to download a 20 MB file using dial up (those were dark days). With modern Ethernet connections you can get speeds of up to 1 Gigabit per second. That’s more than three times the speed of the fastest Wi-Fi connections out there. And that brings us to the last, and arguably the most important aspect that makes wired networks better: security. Let’s face it, wireless networks aren’t very safe. That’s why we have to keep changing the encryption standards. Even when companies and schools pay exorbitant prices to secure their wireless networks up to high heaven, they can still get hacked, and the average person’s security doesn’t come anywhere close to those institutions. And remember, we do everything online, so almost all of our personal information is just out there for the taking. In any neighborhood a reasonably skilled hacker could easily get into 5 or more networks using only a laptop with a wireless connection. A wired network, on the other hand, is completely contained. You have to physically connect to the network to access the information. The only other method of access involves very expensive methods that you probably won’t have to worry about unless you get on the wrong side of a national spy agency. So does that mean that Wi-Fi is horrible? Absolutely not, I love it. Unless you want to be trailing an Ethernet cable behind you wherever you go, which would be impractical to say the least, there are still plenty of good uses for Wi-Fi. But Ethernet is something you’ll definitely want to think about for your own home, business, hotels, or anywhere else you could viably use it. Even if you’ve already built your home, installing cable doesn’t have to be expensive. At Sewell we have all the cable you need to set up a fast, reliable home network. You can even enjoy the speed and reliability of Ethernet when you travel. Most hotels, even the ones without a wireless network have Ethernet connections (which are usually cheaper than Wi-Fi anyway). The problem is a lot of portable devices don’t have Ethernet ports. But that doesn’t have to keep you from using Ethernet. 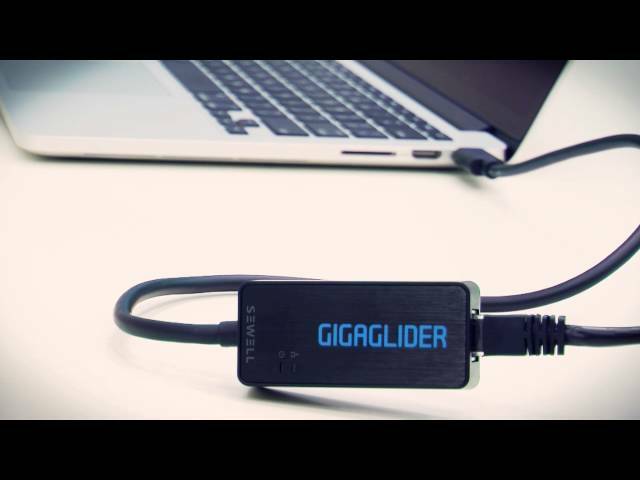 There are plenty of inexpensive adapters, like Sewell’s Gigaglider, that allow you to use Ethernet with those devices at home or while you travel.